Carousel Coral: Top Summer Nail Polishes. Two years ago I wrote three different posts about my favorite summer blushes, lipsticks and lipglosses but I never wrote one about my favorite summer polishes. I realised that haven't done a "nail polish" related post in like ages, in fact my very first blog post was about my favorite winter nail polishes so I think it was about time to talk you about my top five, and of course hottest, summer nail polishes! I really like bright shades on my nails, so every summer I love painting my nails with beautiful corals and peaches and of course neon shades, what can I say, I just love my neons! It was hard for me to choose only 5 since I have so many similar shades but I chose the ones that I've used the most and I'm sure these are some shades that everyone loves to use at summertime! 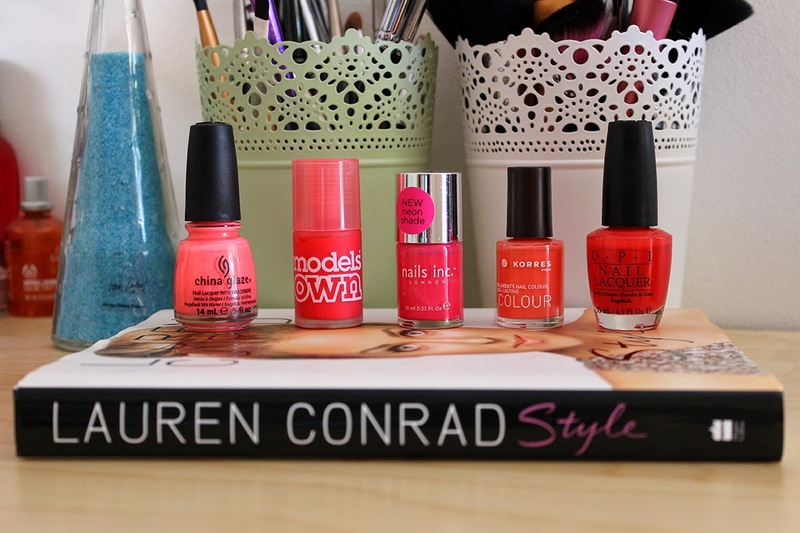 A very beautiful super neon coral-pink shade, in my opinion the hottest pedicure shade for the summer. The only problem I have with this one is the texture, it has a very thick and streaky formula but I can put up with it because of its amazing shade. This is the only Model's Own polish that I own and of course it had to be a neon one, it's a bright warm pink shade with a hint of coral-orange, it has a runny formula that never streaks which I prefer. One of the few cool toned neon pinks that I own, it's really beautiful, not super bright as the other two that I mentioned before but still quite noticable. This is by far the most beautiful orangey-coral shade I own that it's not neon, it's a nice alternative for those who like bright and vivid shades but don't want the bright neon that glows in your face. I saved the more classy one for last, this was actually the first OPI nail polish that I've bought years ago and it's still as good as new! For those who prefer more classic colors on their nails this one is the perfect summer red with a hint of coral just to make it more warm. Do you love bright nails at summertime like me? Let me know what are your favorite summer nail polishes! Τα χρωματα μας! ;) Αυτο το china glaze AXXX!!! Χαχαχα ακριβως! Πραγματι ειναι ισως το πιο ομορφο καλοκαιρινο χρωμα βερνικιου που εχω δει. Όλα ωραία αλλά αυτό το OPI απλά τέλειο! Άσε που φαίνεται τέλειο για συνδυασμό με το Lady Danger!